Sponsored by The Legacy the Women of Color (WOC) gathering actually undermined the legacy of the Gospel! The event, which invited “all women of color to an evening of fun and fellowship” was an auxiliary offering and was only scheduled for an hour and 15 minutes. Yet, not for nothing, it managed to spark fierce debate, confusion, and caused lots of folks to stumble and “feel some type of way” for days preceding and during the conference. Personally, when I first learned of the gathering, I pressed my lips, furrowed my brows and rolled my eyes! This event’s blatant discriminatory and divisive spirit literally smacked me in the face. Why was it even necessary? Why, in the context of the Gospel, was this event needed and what was its Biblical basis? Why were we being segregated? Why were we willingly self-segregating? “An invitation was in the conference booklet so everyone was invited to attend,” a conference attendee commented on Instagram. Yet that’s not what the language in the marketing surrounding this event conveyed. “A special gathering for women of color” on the event flyer is hardly an open invitation for “everyone”. And as I poured over other (official and unofficial) communications about this affair, as well as chatted with a few sisters of color about it, it was clear that our white sisters were highly discouraged from attending. “I wonder what would happen if a group of white women decided to show up,” someone asked as a few of us discussed the event. “We let them in,” I said. The sharp recoils to my response surprised me. I was even more surprised to be described as “kinda narrow-minded” for admitting that I didn’t get why this needed to be a closed event. The way my renewed mind is set up, the Gospel creates absolutely no room for such a gathering within the Body of Christ. And tried as I might to educate myself so that I could “get it”, my spirit wholly rejected it - especially after I read an article I was told better articulated why the event was necessary and why exclusivity was required. But these examples demonstrate discipleship and focused training and teaching, not creating “safe spaces” for “fun and fellowship” or to discuss “shared struggles” apart from the larger Body. Indeed, Jesus worked with select disciples at times at His discretion that would benefit the “whole”, as Boyd describes. But He didn’t segregate the disciples to build them up according to their flesh. The focus was spiritual growth and to address spiritual matters, and those spiritual matters always pointed back to Christ. The WOC gathering wasn’t intended to build up “the whole”. It was specifically for women of color to come together and “love on one another” and "pray for one another" APART from the “whole”. When Scripture says, “There is neither Jew nor Greek, there is neither slave nor free, there is neither male nor female; for you are all one in Christ Jesus” (Galatians 3:28) it is making it plain that our ultimate identities aren’t according to the flesh, but according to Christ. Even as we live in the flesh, as whatever race, gender or social class, we are to walk out our unique existences according to the same Spirit (1 Corinthians 12:13). With Galatians 3:28 in mind, many wondered how it was possible to disagree with the women of color gathering while supporting a women’s conference. Easy. Just look at the SPIRIT driving the respective events. Did it align with the spirit of Jesus Christ, in whom we are ONE? Which identity did we ultimately have to represent at either event - our identity in Christ or our identity according to the flesh? The Gospel Coalition’s women’s conference is “for women, but not all about women." It points to Christ in that it prepares women for our unique roles as co-laborers in Christ. It grants us spiritual and practical resources to ensure we, ourselves, are better rooted in Christ and better equipped to serve our families and local church bodies. Gathering together in a “safe space” to let our hair down and vent about our “struggles” as women was not the purpose of our convening. It wasn’t conceived to give women a “safe space” from the guys. In fact, there were male attendees, speakers, worship leaders, facilitators, and volunteers there, and I never once saw any marketing or promotion for the conference encouraging men to “keep out”. If Christ is the foundation, there is a way to host an event with a focused agenda without it having a divisive or exclusive undertone. I certainly mean Boyd no disrespect (as I happen to know this sister in Christ through mutual acquaintances), but I was deeply troubled to read these words! 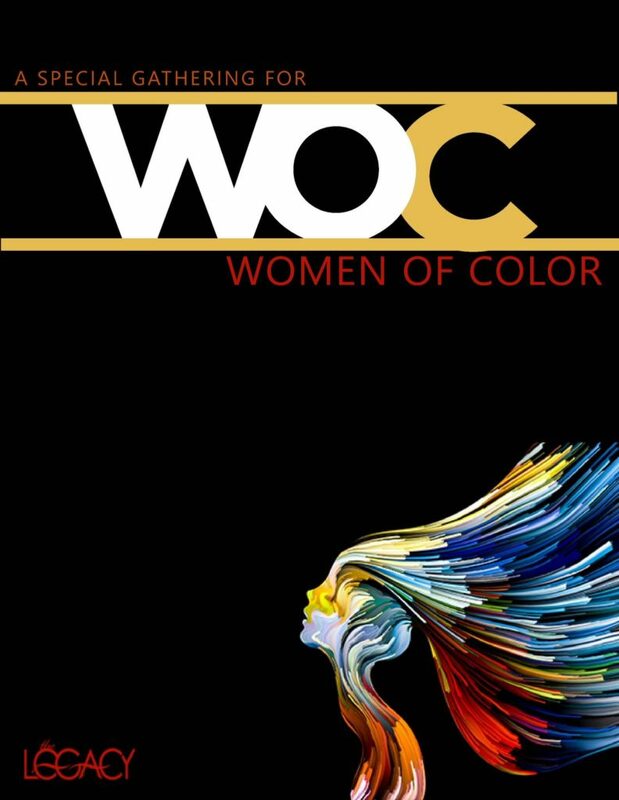 Not only is it clear that the WOC event was conceived to intentionally self-segregate, it was prepared to intentionally exclude on the basis of race. That blatantly contradicts the Gospel! As the Apostle Paul writes, under inspiration of the Holy Spirit, “there should be no schism in the body, but that the members should have the same care for one another. And if one member suffers, all the members suffer with it; or if one member is honored, all the members rejoice with it” (1 Corinthians 12:25-26). If we simply want an evening for “fun and fellowship” why can’t we welcome our white sisters in Christ to join us? If we have legitimate struggles as women of color within the Body of Christ, why can’t we just clearly and specifically articulate them so that others in the Body can share our burdens and, where possible, help address our concerns? And if we believe said struggles have come at the hand of our white sisters (and brothers) in the Body of Christ, why can’t we just GO TO THEM, tell them their faults and offer them the opportunity to repent that we might win a sister (and brother)? To host an event like this DURING a larger CHRISTIAN gathering where the implied culprit for our woes was present does nothing to address the problem. In fact, it only creates an even greater wedge between us. And if the goal was simply for Christian women of color to fellowship with one another, I’m afraid partiality, discrimination and hypocrisy were at play, even if unintentionally - and that’s terribly sad. Days leading up to the event, all I could do was recall the scene of Paul opposing Peter - to his face- for separating from the Gentile Christians upon the arrival of the Jewish Christians at Antioch. Peter was a hypocrite and undermined the truth of the Gospel for this move, and he caused other Jews to sin as they followed his example (Galatians 2:11-14). With this confrontation in mind, I decided to attend the event in hopes of standing for truth and to lovingly appeal to those who would be present. I wanted to talk to my sisters, and I was curious to hear what the panelists had to say. After we were dismissed from the general session that immediately preceded the WOC gathering, a herd of women maneuvered our way out of the auditorium and to our respective evening activities. It was heartbreaking and embarrassing to witness our white sisters take notice of the “Women of Color Gathering” signage that marked the event’s location then make their way in the opposite direction. We were a group of Christian women who had just finished worshipping OUR God side-by-side, but now we were peeling off on the basis of skin color! Call me dramatic, but I actually felt a rip. One-by-one, we melaninated sisters plucked ourselves apart from the herd and made our way into the event. And, if I’m honest, I actually felt really STUPID walking through its doors and considered my own hypocrisy for even being present. No matter my intentions, I immediately began to regret my decision to attend. My friends and I made our way to a table with two sisters sitting off to the side by themselves. We decided to sit with them and immediately struck up a dialogue, prompted by a discussion question at our table. “What can the Body of Christ do to support WOC (women of color),” the question read. From my humble perspective, Hill Perry's sentiments seem a bit inconsistent to me. She's a Black woman who feels welcomed and loved by white Christians and is in "these spaces" all of the time, yet she charges "evangelicalism" with undervaluing women of color and implies it is the reason we're "unseen". My perspective also considers extraneous factors such as population size. Statistically speaking, people of color have long been and are presently the minority population in the United States and Europe, where the majority of the world's professed Christians reside. Taking this into account, I've always figured we're naturally going to be the minority at "conferences such as these" - at least until upcoming generations, which entail a minority-majority, come of age. So, how then is our feeling "alone" the fault of the BODY of Christ? What, specifically, do we want the Body of Christ to do make us feel less “alone”? And why are we referring to “the Body of Christ” as if we aren’t part of it?! Eventually it was time for the panel discussion to begin. As the panelists were called up, to my surprise, the two women who were initially sitting alone at our table - Elicia Horton and Jeany Kim Jun - rose up and took their seats on stage. They joined a third panelist, Janette..Ikz (pronounced “genetics”) and panel facilitator Kristie Anyabwile. As the panel discussion unfolded, sentiments previously communicated by Hill Perry were beginning to take more shape. I was finally beginning to get the specifics I’d been seeking, and honestly, a more Gospel-centric agenda was beginning to manifest itself. “I want to let women of color know there are women who look like them who have sound teaching,” said Janette…Ikz, who also expressed concern that her race (African-American) was synonymous with false doctrine. “I have a heart for seeing more women of color engaged in word ministry,” shared Anyabwile of her desire to create a directory of doctrinally-sound women of color writers, speakers, teachers, poets, etc. “We have to voice the need and encourage one another and find the people who are in charge to let them know we’re here,” said Horton in reference to increasing diversity in speakers and teachers at reformed/evangelical conferences and events. “I want to show my daughter that I’m out here,” stated Jeany in reference to increasing the representation of Christian women of color for upcoming generations. The “Body of Christ” is subconsciously equated to “white Christians” by those inside and outside the Church. Christianity remains to be seen as a largely white man’s religion, and when we boil Christianity down to Biblically-sound doctrine and theology, it is perceived as something only whites can grasp and teach. Communities of color, namely the African-American community, still largely align with churches and teachings rooted in culture-specific and prosperity-based doctrines, which contradict the Gospel. Opportunities for women/people of color who espouse Biblically-sound doctrine appear to be limited. In essence, we want to feel as if we truly do belong in the Body of Christ and that we are rightly represented in it. This is a reasonable and noble desire. After all, the heart of the Gospel is God calling unto Himself through Christ a redeemed people from every “nation” (which, in Greek, is “ethnos” for “ethnic group”). John 3:16 says, “For God so loved the world that He gave His only begotten Son that whosoever believes will not perish, but have everlasting life.” Acts 10:34-35 says, “God shows no partiality. But in every nation whoever fears Him and works righteousness is accepted by Him.” The prophet John saw in his vision “a great multitude which no one could number, of all nations, tribes, peoples, and tongues, standing before the throne and before the Lamb, clothed with white robes, with palm branches in their hands, and crying out with a loud voice, saying, “Salvation belongs to our God who sits on the throne, and to the Lamb!” (Revelation 7:9-10). Christ’s inheritance is all nations of the earth (Psalm 2:8, 22:27, and 82:8). Indeed, diversity is a "God thing”. And diverse representation would actually help serve evangelistic purposes. (I was sure to make this point at the gathering.) While we in the Body don’t rest our identities in our flesh, we can certainly leverage our race or ethnicity to engage the lost, who still see the world on those terms. Of course, one still has to be receptive of the Gospel truth when they hear it. But it is undoubtedly beneficial in our quest to “be all things to all people that we might win the more” when amongst those “things” is shared ethnicity with those we’re hoping to reach. For example, I’ve heard white missionaries express their desire to see more people of color in the missions fields as some cultures around the world tend to be more suspicious of whites than of people who look like them. So again, there’s absolutely nothing wrong with desiring to see diverse peoples represented in the Body of Christ. Yet, I don’t believe this desire, nor this event’s agenda, had been fully thought through at the time the WOC gathering was first conceived and marketed. I still hold that it seems the event was driven by the flesh rather than the Spirit, because if this is all we really want (as this was all we really discussed) it didn’t require a segregated meeting to voice it - and it would have been helpful, in the spirit of diversity, to create a space for our white sisters to also hear it. Moreover, these concerns are organically addressed by the Gospel! All we need to do is what Jesus has already told us to do and we’d get the results we desire. Too often we err in attempting to solve problems in our own strength and human wisdom when the Lord has already given us what we need to solve them. If we would only 'seek first the Kingdom of God and His righteousness, all things will be added' (Matthew 6:33). If we want to see more sound Christians of color represented in ministry, we can start by being sound Christians of color who go into ministry. And we can all do that by simply carrying out the Great Commission (Matthew 28:16-20). If we want to see more sound people of color in the Body of Christ, we need to share the Gospel with and disciple more people of color. If we want to see more diversity “in these spaces” we can invite more people of color to our Biblically-sound churches, conferences and events. It doesn’t take a segregated meeting to reach this goal. It merely takes those who are set apart in Christ to do the works to which He’s called us. Ironically, diversity becomes visible when everyone who professes Christ actually lives out their faith and place their identity in Him. I didn’t start this blog to be a Black Christian in “word ministry”. I started this blog because I love Christ and enjoy sharing and defending His truth. I HAPPEN to be Black. Voila! A Black Christian writer/blogger. Done. Representation on deck! And as it relates to "letting the people in charge know we’re here": First, no one is going to know we’re here if we’re holding up in a room commiserating only amongst ourselves. We need to keep the lines of communication open with the “whole” Body! Second, it seems to me that creating space for women of color isn’t as much of an uphill battle as we're tempted to assume, considering The Gospel Coalition was willing to grant space to the WOC gathering (even if the event was conceived/promoted in the wrong spirit), the TGCW18 conference had an array of women of color speakers/facilitators, and Hill Perry and others are "in these spaces all of the time". Third, ultimately, the only Person in charge of "these spaces" is Jesus Christ! White people aren't the gatekeepers. The LORD puts us where we need to be. If we’d only do what God’s equipped us to do, our GIFTS will make room for us (Proverbs 18:16, emphasis added). I heard a lot of terms like “systemic oppression” and “white privilege” tossed around to justify this event as if white Christians have a monopoly on Jesus! They can’t keep us out of anything truly of God, and the true among them won't and wouldn't desire to! Some of the lack of representation we're seeing "in these spaces" is simply because some, if not many, of us refuse to enter into them. But if a sister or brother of color is being discriminated against in any professed Christian setting, it ain’t a Christian setting. They need to get out of it and don’t DARE fight to be part of it! Folks need to check their hearts when it comes to matters of race because, in the Body of Christ, there’s no room for this ongoing foolery. We cannot keep carrying the world's bitterness, inferiority complexes, mistrust, racial bias, fears and racial tensions in the Lord's Body! We need deliverance from this madness, pronto! Either we love one another or we don’t. Either we’re going to submit to Christ’s teachings and openly address matters, express compassion, bear one another’s burdens and quickly forgive or we won’t. And we need to know that if our fellow sisters (and brothers) bear the image of Christ, they DO look like us! I was not here for the WOC gathering, even as I was there in attendance. But I am grateful to God for the fruit He allowed it to bear in spite of ourselves. I better recognize a need to be more intentional in engaging and discipling communities of color. And, being present, I was able to humbly request that any future gatherings be open to all. Even if the focus is on women or people of color, we need our white sisters and brothers to hear whatever it is we need to say, to join us in devising practical, sincerely Gospel-centric solutions, and to love on us, pray with us and stand with us in Christ. We are one Body with many parts - each part matters! Yet neither part matters so much that it can properly function apart from the "whole" (1 Corinthians 12:12-27). Self-segregation will never yield unity, and one-sided conversations will never produce understanding. If we want to feel included and visibly represented in the Body, we can start by cancelling self-segregated meetings! Whatever our needs or concerns, my sisters, the Gospel is enough.